Summary: Sixteen-year-old Elli was a small child when the Elders of Kupari chose her to succeed the Valtia, the queen who wields infinitely powerful ice and fire magic. Since then, Elli has lived in the temple, surrounded by luxury and tutored by magical priests, as she prepares for the day when the Valtia perishes and the magic finds a new home in her. Elli is destined to be the most powerful Valtia to ever rule. But when the queen dies defending the kingdom from invading warriors, the magic doesn’t enter Ellie. It’s nowhere to be found. Disgraced, Ellie flees to the outlands, the home of the banished criminals — some who would love to see the temple burn with all its priests inside. As she finds her footing in this new world, Elli uncovers devastating new information about the Kupari magic, those who wield it, and the prophecy that foretold her destiny. Torn between the love she has for her people and her growing loyalty to the banished, Elli struggles to understand the true role she was meant to play. But as war looms, she must align with the right side — before the kingdom and its magic are completely destroyed. This is the first book by Sarah Fine that I’ve read and I can confidently say that I look forward to reading more! The Impostor Queen had me hooked from the very first pages and still hasn’t let go even though I’m long done reading. One of the biggest hooks for me was the characters. I was really invested in all of them; even the ones I strongly disliked. I absolutely loved Elli, Oskar, and Freya! I wanted them all to be real and come be a part of my life. I ended up having a particular soft spot for sassy little Freya. She’s like the little sister I always wished I had. Witty, funny, adorable, sweet, and just a bit of a trouble maker! Elli showed incredible growth throughout the story; going from being sheltered and not knowing how to do basic things for herself, such as getting dressed, to contributing to her new community and harnessing her own fate to the best of her ability. While she is a fighter at heart, we also see that Elli isn’t infallible. She has moments of weakness, just like the rest of us. She gives in to sadness and pain at points. All of these things made her incredibly believable as a character and really had me emotionally invested in her well-being. Oh and Oskar! Sweet, rugged, “please be my book boyfriend” Oskar. He made me swoon, hate his stubbornness, feel sorry for him, and hope for his success. At points I wasn’t just hoping that he was real…I felt like he really was. For me, he wasn’t the type of leading man that I’m used to. I honestly found myself thinking he was being annoying in certain scenes! Not the off-putting kind of annoying, he’s still very lovable. He just irritates me sometimes, the way the people closest to me do at points even though I love them dearly. I strangely think it made me even fonder of him, which is new for me. 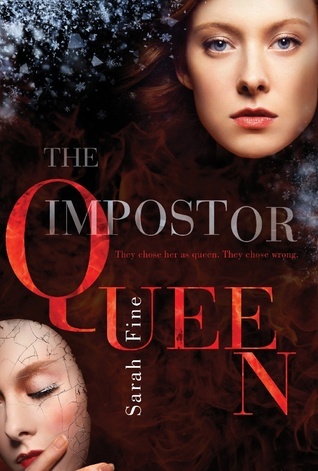 Sarah did an incredible job with the world-building in The Impostor Queen as well. I had vivid mental pictures of the various settings at all points while reading. The dwellings in the outlands were especially strong for me, my mind went wild imagining all the different furs and ‘makeshift’ housing setups. It really brought the people living in there to life for me. In the temple, Elli was conditioned to see them as criminals but in reality they have built such a resourceful, complex world for themselves. Ice and fire magic…HOW COOL IS THAT?! The idea of elemental magic isn’t new, for sure, but I am so captivated by how it is delivered in this book. The idea that the Valtia is not only bestowed with incredibly powerful amounts of both, when most can only wield one type, but that she represents harmony of the two opposing forces. The Valtia’s incredible ability to use them in tandem to do things like create storms is such an interesting take on the awesome power of nature and how, I’m sure, many of us wish we could control it! I love, love, LOVE stories about magic. The Imposter Queen is no exception to that statement. The Impostor Queen is a thrilling, fresh story of magic and royalty that doesn’t let go once it gets a hold of you. I highly recommend this book…and may have enthusiastically used shouty caps once or twice or maybe a couple of hundred times to talk to people about it. Is it too late, now, to say sorry? Oh well, I wouldn’t apologize anyway because I LOVE THIS BOOK! Now to keep calm while waiting for the next one.